.Film and other celebrities will join and support the cause. With the International Women’s Day campaign theme : “Be Bold for Change” to promote women safety, Hyderabad City Police also plans to work towards creating awareness regarding women safety in different ways. The campaign has been especially conceived to raise awareness among girls , women on the responsible usage of Digital Technologies and participation in online community activities. Hyderabad City Police is keen to mark 2017 as a year of change especially when digital technologies has become an integral part of our lifestyle and impacting daily lives. With growing influence of digital technologies in all walks of life – lot of people are getting exposed to threats and cybercrimes. Be it privacy violation, identity theft or any other facility that can potentially expose the contents & accounts owned by a user, vulnerability to cyber threats is rising. The occasion of the International Women’s Day is the perfect platform to launch this campaign and take concrete steps to raise awareness on Women’s safety, Cyber Crime and Child abuse. A number of initiatives are being planned to enhance the citizen awareness for responsible usage of digital technologies and limit the threats of cybercrime. SHE Teams which are at forefront of tackling crime against women have already gained extremely massive acceptance. The BHAROSA center which is one of a kind facility playing a vital role by engaging women and children victims of grievous sexual violence on counselling legal support and future rehabilitation of relief. There is also a need to create awareness among children as well as adults regarding child sexual abuse. This campaign will also help in this regard. 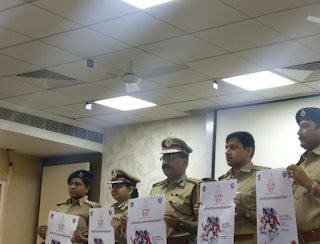 Hyderabad City Police will be hosting Awareness Run at Necklace Road on March 5 in two categories – 5 Km & 2 Km run and also Pram Walk with an expected footfall of 7000 from all parts of the life. Another important initiative is a specially designed Women’s Expo with over 50 stalls with of cultural events, which will be inaugurated on 4th March 2017. Multiple competitions are being organized in categories like Videography (Short Films), Photography, Painting and Poetry related with Women’s Safety, Cyber Crime and Child Abuse issues. The participants can submit their entries directly at Bharosacenter, Ground Floor HACA Bhavan , Saifabad, Hyderabad. This will be prizes for winning entries who would be awarded on 5th March, 2017. The Last date for submission of entries is 28th February 2017. Citizens are requested to join the campaign and make it a grand success.